This substantial documentary displays the genre at its most vital: telling a story for a subject incapable of voicing complaint. Gabriela Cowperthwaite’s Oscar contender for Best Documentary Blackfish is more than just another critically lauded documentary many won’t bother watching—it’s an ideal example of the medium’s power. This substantial doc displays the genre at its most vital: telling a story for a subject incapable of voicing complaint. Focusing on captive killer whales at Sea World, Blackfish breaks down disillusions built by millions of vacationing families and a company hiding the truth from each and every one of them. But you probably already know all that. By now, there’s not much to be said about Blackfish that hasn’t already been covered by critics, fans, and the media since its debut at Sundance in January of this year. Like many great documentaries, the film took on a life of its own in the news. Many of the facts were dispersed. Many of the film’s discoveries were affirmed. Much of the film’s message has become cultural knowledge, and that’s a testament to its strengths. Yet nothing you read, no news story you skim, no angry opinion thrown out in your social media feed can replace the powerful experience of actually sitting down and watching Blackfish. The beautiful and big subjects of Blackfish lend themselves perfectly to a visual medium like cinema, and Cowperthwaite doesn’t disappoint. There are plenty of gorgeous shots of the killer whales both within and outside of confinement. Even some of the older footage captured on VHS cameras or shown on old tube televisions is presented in a visually engaging manner, dutifully serving the subjects. If the content wasn’t so traumatic, Blackfish could be watched over and over in a relaxed state like Planet Earth or Disney Nature films (though it’s not quite as magnificent as the former). It’s this commanding cinematography combined with the heartbreaking, shocking, and often frightening discoveries that make Blackfish worth its very brief 83 minute run time. It’s not just for animal welfare activists, environmentalists, or bleeding hearts looking for a cause to back. God knows I have my own issues with PETA. Cowperthwaite makes it clear she didn’t go into this with any agenda other than that of a documentarian. In the disc’s relevant batch of special features, she states she’s a “documentarian by trade”. That comes first to her, and it shows in the final product. Cowperthwaite says repeatedly in the disc’s bonus features, including a commentary track and a special interview with the director after the film’s release, she did not set out to make a controversial film. She became interested in the story after reading of SeaWorld trainer Dawn Brancheau’s death in 2010. She said she had been to SeaWorld as a child and again with her own children. The material she presents speaks for itself, and Cowperthwaite lets it. There’s a dearth of sentimentality in the film (thankfully), but what is there is drawn out naturally from remorseful subjects looking back on a terrifying past life. Two other special features focus on Dr. Naomi Rose of the Animal Welfare Institute. Dr. Rose was not part of the feature film, but her views seem to (neutrally) coincide with what was said in the film. Titled “The Truth About Wild Whales” and “Alternatives to Captivity”, Dr. Rose discusses practical solutions and specific examples of realistic alternatives. They’re only three-to-four minutes long, but they add another reputable source to the endeavor. The other four extras focus on one of the subjects already depicted in the documentary. The former SeaWorld trainers tell stories of past practices or touch on subjects just outside the thesis of the documentary. For instance, Dean Gomersail and John Jett discuss how some captive whales’ lives are threatened by mosquitos carrying toxins. The whales would have never encountered these specific mosquitos in the wild, and Gomersail’s account of a whale’s death from the disease is quite grisly. The extras are just that: extra content. They’re inessential, but compelling to anyone affected by the whales’ plight. Blackfish, though, carries nothing inessential. This is a film of unique quality and insight with a direct or indirect tie to us all. 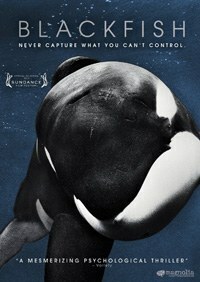 So from one reticent documentary viewer to another, please don’t let Blackfish pass you by.